Thanks to a comment on my last post about saying no to a bad postal bill, I learned from The Creative Beast about another wonderful little campaign called Send the Love. This one is more about good energy than politics, but gratitude is a powerful thing, and letting our postal workers know we appreciate them has to brighten their day. So this idea is all about "sending messages of support and gratitude for our postal workers during this time of crisis." Next time you put something in the mail, on the back of the envelope, make a mark of support to show postal workers that you value what they do. Just draw a simple heart with a P.O. inside. If you’re more creative, make a drawing or write a note. The postal workers who handle the mail, from the person who takes it out of the blue collection box to the people who do the sorting and processing to the person who puts it in your box — they will all get the message. So many postal workers make sure your mail gets where it’s going. Send them some thanks. I've always wondered about the effectiveness of those types of ideas. 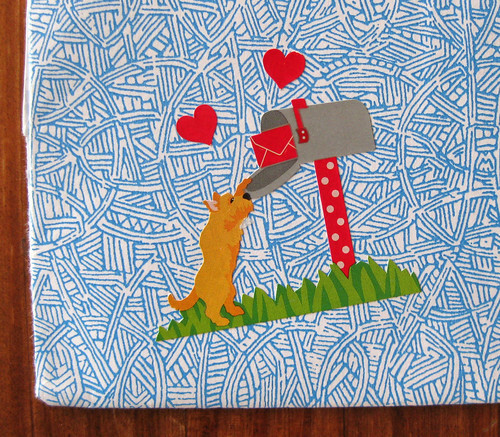 For example, I've come across a number of mail art bloggers who think that they are brightening a postal worker's day by sending odd-sized or brightly coloured objects through the mail. I'd like to know what postal workers REALLY think about that (of course, every postal worker will have different opinions; just because you do a certain job doesn't mean you have a specific mindset.... like medical workers who smoke!) I imagine that for many, odd packages cause hassle from the postal worker's point of view. I also wonder if postal workers have the time to actually examine packages or envelopes. I'm gonna relate this to me: a lot of people will exclaim over how cool it is that I get to handle one-of-a-kind, archival documents. But as an archivist, I don't have time to sit there and drool over the awesomeness of history, I'm too busy making sure these objects are findable, cataloguing them, helping patrons find these things so THEY can sit and drool/study/etc. Does anyone reading this know any postal workers who would be able to address if postal workers actually have time to LOOK at the items they are processing? I imagine possibly frustrated searches for postal codes or city names on odd envelopes/packages rather than exclaiming over cool art. It's a very sweet idea, but I would imagine that personally talking to a postal worker, writing letters to USPS management and members of congress, or giving a thank you card like what Ambrosia has done would be far more effective than random messages on an envelope. Carrie - I agree with much of what you say. That's why I contacted my legislators first, and then drew nice messages on letters. I have brought enough packages and letters to post office counters to say that some postal workers get a kick out of some of the decorative things I send, and others completely ignore them. Everyone responds differently, and I figure one might as well send some good energy. You're probably right, though - direct thanks and action are best. I think that both direct AND indirect action is helpful. And I wrote my overlong bossypants comment before actually clicking on the links you provided -- it's good to see both direct and indirect actions are being promoted. 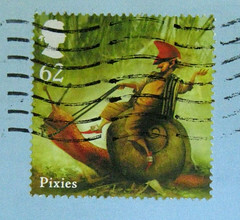 Once-upon-a-time I had a penpal who would always leave little messages for the postie on the envelopes she was sending ~ I thought it was a sweet gesture.